Thursday, Feb. 14, 2019, 5:30 – 7:30 p.m. 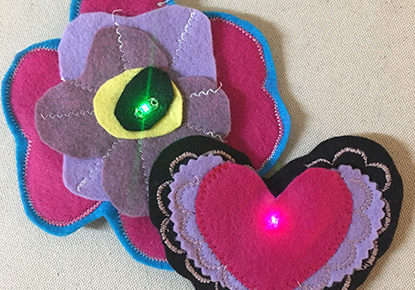 Create your own LED Felt Brooch using basic circuitry and electronics. Registration is required. Learn how LEDs (light emitting diodes) are used to turn a piece of fabric, like felt, into an electronic textile. Your small wearable light show will be, simply, brilliant! This project involves hand sewing. A sewing machine will also be available. Recommended for ages 12 and up.